Adobe Indesign represents the industry standard for marketing collateral and print design. 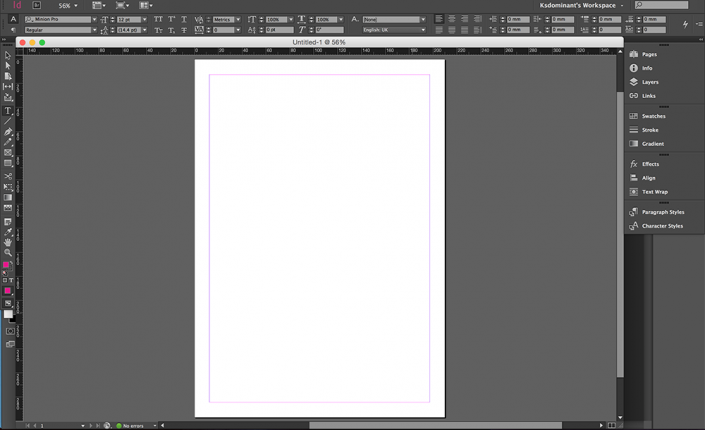 Indesign a powerful tool used for producing posters, brochures, pdf documents, digital and traditional magazines and other design layouts with photos, artwork and typography. Learn to create professional page layouts on one of our highly recommended Adobe Indesign Training courses. Indesign is used worldwide by many marketing and creative design departments to create content that can be printed, published or viewed on tablets and other mobile devices. The courses listed below are private courses which can be tailored to suit your particular learning requirements and delivered at your site (within the london area) or at ours. We support all versions of Adobe Indesign – See below for a full list. All training is conducted at our state-of-the-art training centre, conveniently located in central London. We can also conduct private training courses at your location. We deliver high quality training from experienced trainers in a spacious, air-conditioned and commodious learning environment. Solutions to industry-specific circumstances are taught through a variety of stimulating visual, auditory and fun kinaesthetics with practical demonstrations, one to one support, engaging tutorials, critique and invaluable course material. At competitive prices, Our classes usually consist of just 5 to 6 students to ensure that you get the individual care, comfort and attention you deserve. Book now to receive a 30% discount off all courses! No strings or complications, contact us now for more information! With over 10 years of development, our courses have enhanced the skills of photographers, illustrators, designers, magazines, advertising agencies and new media companies, making us the UK’s leading Adobe course provider! A number of our courses lead to nationally recognised qualifications and course certificates and course manuals are supplied. We’re happy to offer tailored private training for individual, business, corporate and public sector needs. Training can take place at your home, office or in fully-equipped training rooms, anywhere in the UK or worldwide. Courses can be customised to include particular topics to satisfy your unique and specific requirements (we will provide you with an initial training analysis for bespoke training solutions). This is ideally suited both for individual one to one training and for larger groups of up to 15 people. Click to go to one of our Indesign course pages where you will find positive testimonials.